Recover any files in 550+ formats from computer storage devices and other portable media for Windows, Mac and Linux File Systems. All devices are supported: your PC's hard drive, other portable media like USB, mobile phones, digital cameras, media player, and other storage devices. You are allowed to preview lost photos or audios before recovery so that you can check whether they are the ones you want to get back. You are free to preview the files during the scanning process, as well. You are available to selectively recover either the whole drive or specific files. Pause the scanning process when you find the files you want to recover, or restart it afterwards. Resume Recovery mode allows you to import the saved result without scanning again. 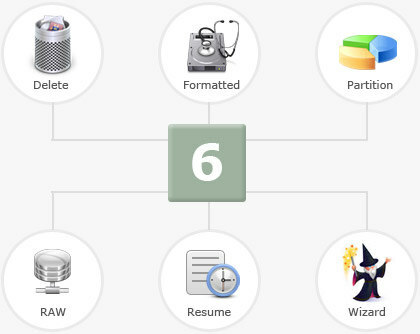 Filter your recovered files by file name, data and size to find files quickly and precisely. This Data Recovery is completely safe. It never damages the original files or your device. Follow the clear and friendly instruction on the interface, you can recover lost or damaged files from storage device with only 3 steps. No prior skills required. Users of Data Recovery Have Surpassed 710,000+ Worldwide. I never thought those precious photos on my D disk could be brought back. This Data Recovery is pretty smart in recovering deleted files. A million thxs.